Last cruise, I was finally able to fulfill my dream of going to Florence. I got off the ship with a group of 8, planning to take public transit. 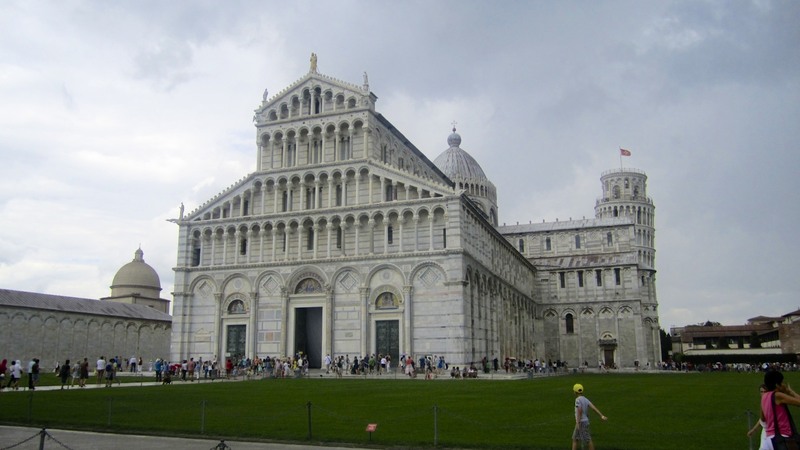 In the cruise terminal, however, a charming taxi driver approached us offering a tour to Pisa and Florence. The major selling point was that the van was equipped with wifi! On our way to Pisa, we learned more about our driver. His name was Andreas, and sadly, since he was extremely attractive, he was married with two children. After the tourist season ended, he and his family were going to take a long vacation to Thailand. He also had great taste in music! The playlist for the drive was right up my alley. Since I already had my photo session at the Leaning Tower of Pisa, I just grabbed a coffee and wandered around during our 15-minute stop. I ran into one of the guys from the sport staff, unsuccessfully trying to take a selfie. I helped him get a decent photo, and then went back to the van. The drive to Florence was beautiful. 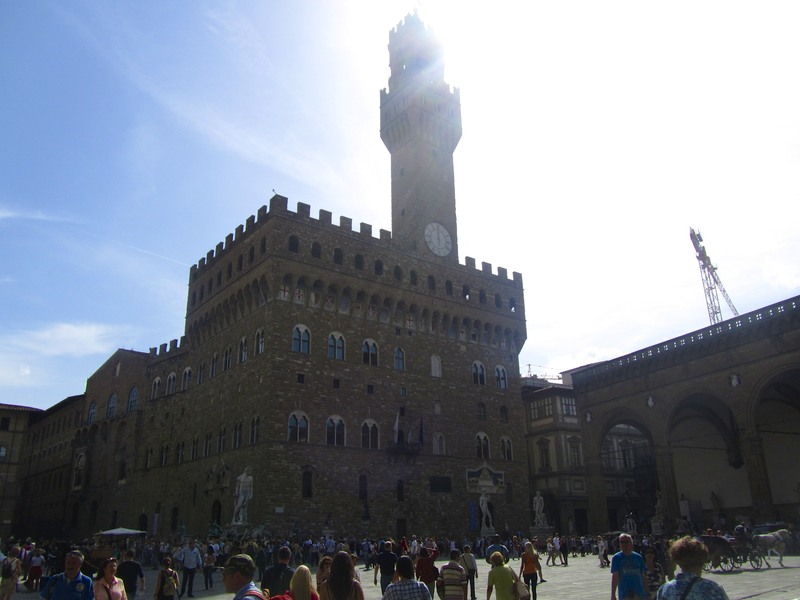 When we reached the city, we were dropped off at Piazza Duomo, given maps of the city, a suggested route, and set a meeting time 4 hours later. 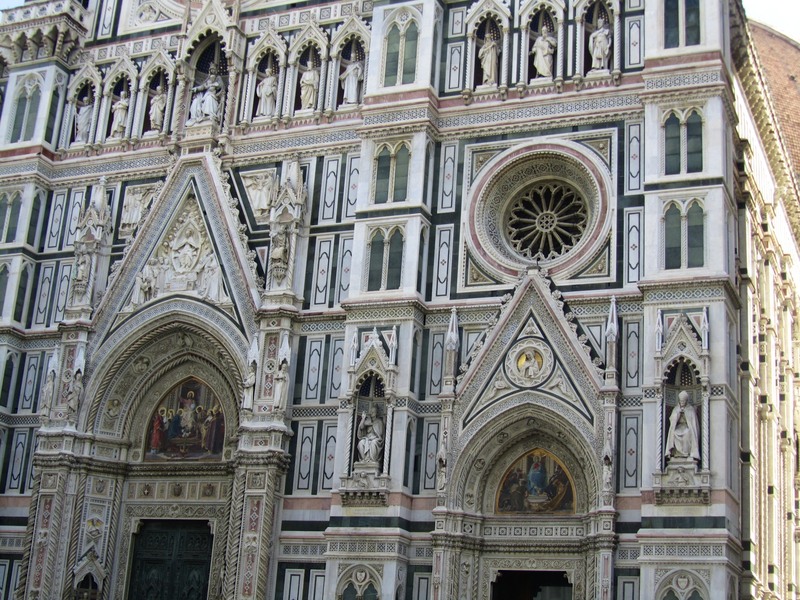 We first stopped at the Basilica of Saint Mary of the Flower, originally called Il Duomo di Firenze. 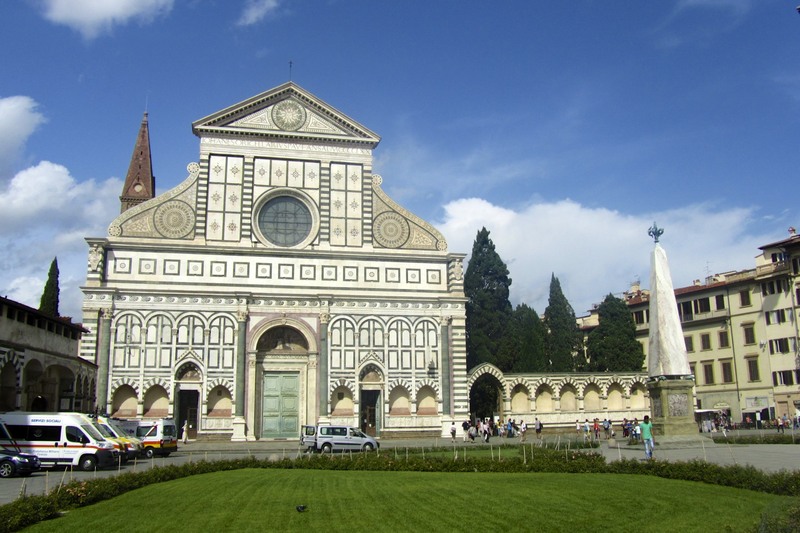 Arnolfo di Cambio designed the Gothic style basilica in 1296. 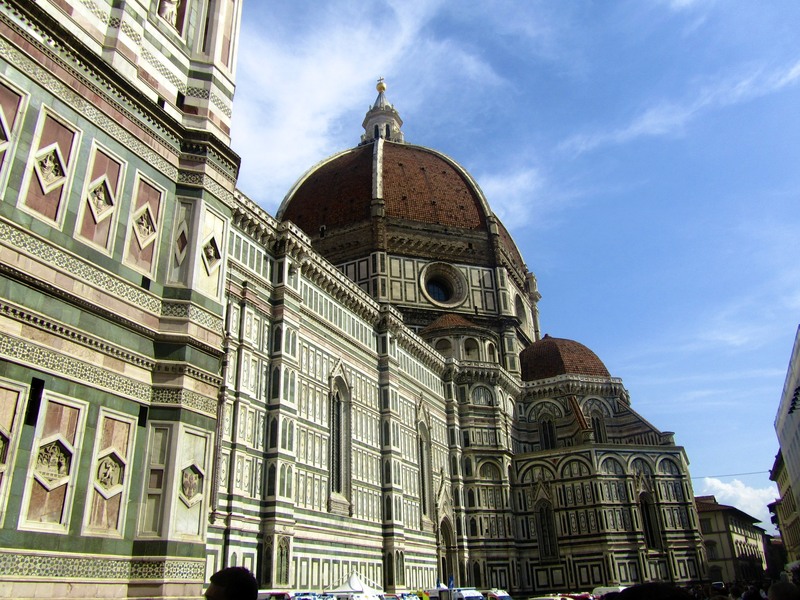 Filippo Brunelleschi completed the dome in 1436. 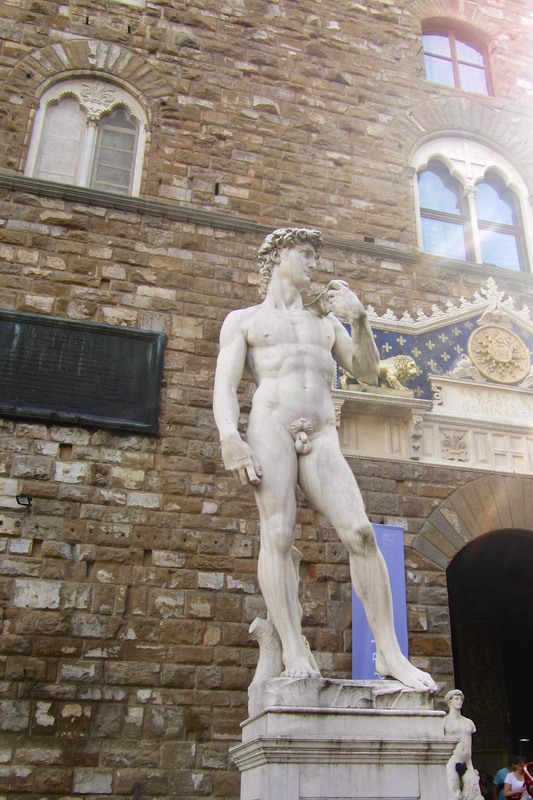 From there, we walked down Via Calzaioli to Piazza Signoria to see the imitation statue of Michelangelo’s “David”. The original statue is across the city at the Academia, but photos are prohibited. 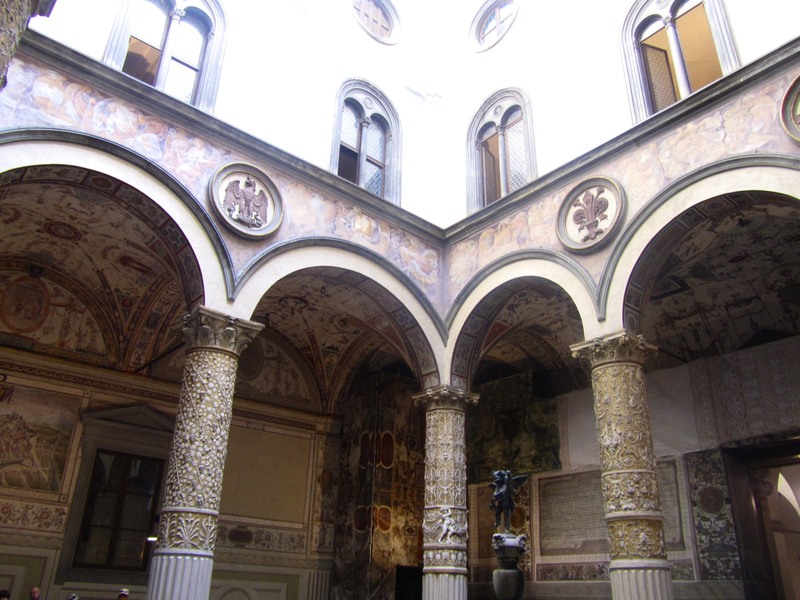 We then walked through the cortile, or internal courtyard, of the Uffizi Gallery, a structure originally built for Cosimo de Medici as the offies for Florentine magistrates. We ended up near the old bridge at Ponte Vecchio. 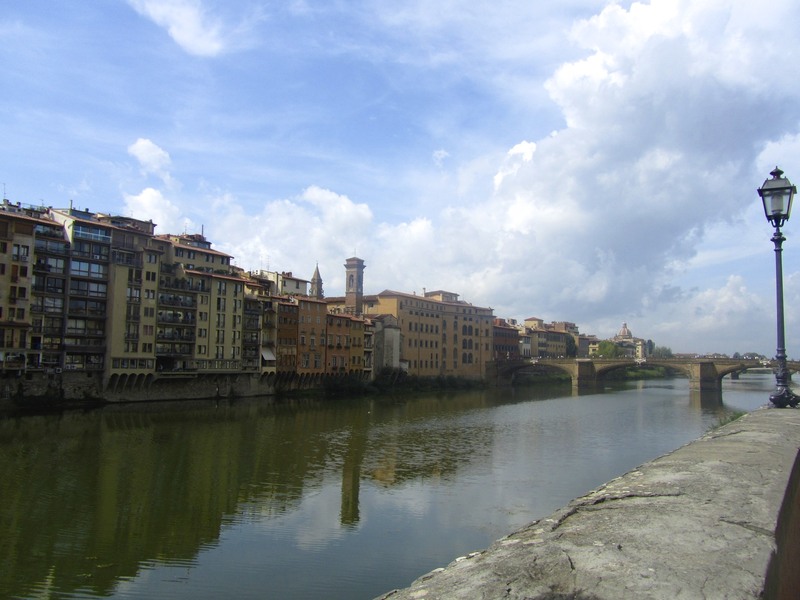 The bridge is lined with shops and fantastic views over Fiume Arno. After taking a few photos and grabbing some souvenirs, we walked southwest, outside the general tourist area, to find lunch. We read some delicious sounding menus, before ending up at a pizzeria. There were a few picky eaters in the group, so pizza was the safest way to satisfy everyone. After lunch, we wandered through a market at Piazza Madonna, then went to the Academia in hopes of seeing the original “David”. Unfortunately, the lines were much too long. We decided instead to do a bit more shopping and get some gelato. When we met back up with Andreas, we had an easy drive back to the ship. I was sad to leave the city, as there as still much more that I’d like to see. 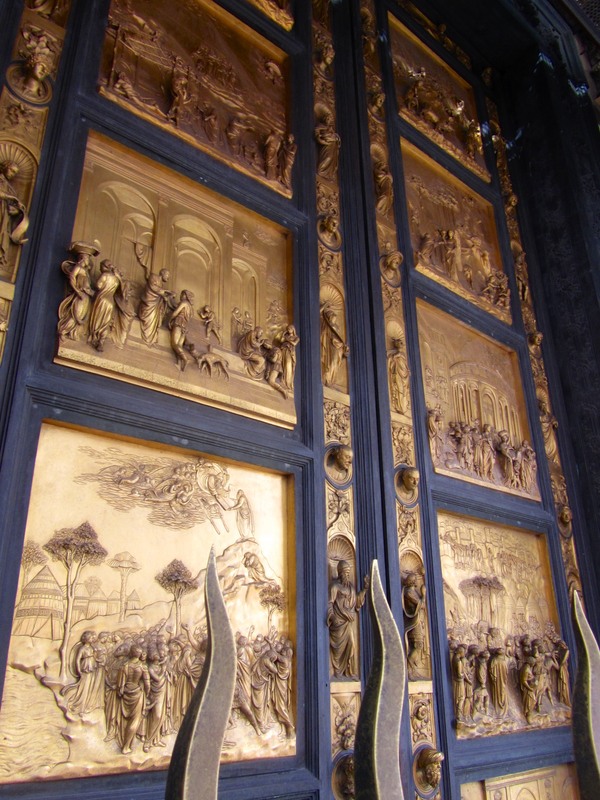 However, I was extremely satisfied with my day in Florence! Italy, I will be coming back! 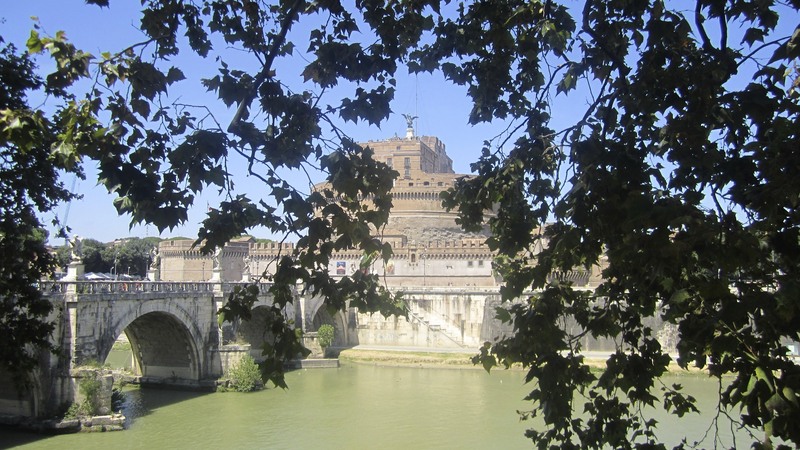 When my sister and her husband were cruising, their friend wrote out a thorough tour for them to follow in Rome. I was able to take part in a “Rome on Your Own” tour for the crew, so I decided to follow the same tour. Unfortunately, I didn’t have time to do everything that was recommended, but I still had one of the greatest days of my contract. The tour bus dropped us off near the Vatican Museum. I pushed through the crowds with my dance captain and her boyfriend– two of my frequent travel companions. 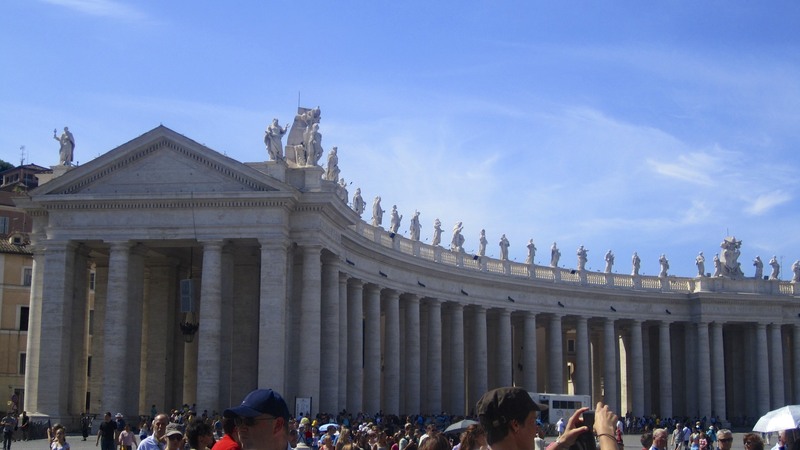 We started at St. Peter’s Square, a large piazza designed by Bernini. The sight of St. Peter’s Basilica was fantastic. Since the weather was so beautiful, we chose not to go inside, but rather to keep walking in the sunshine. 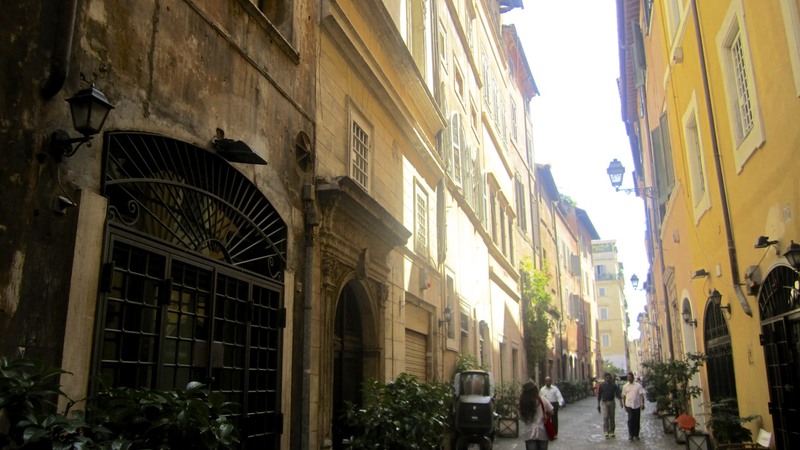 My goal of the day was to see the Pantheon, so we made our way across the Tiber and strolled down Via Dei Coronari, a beautiful little pedestrian street that would take us to our destination. 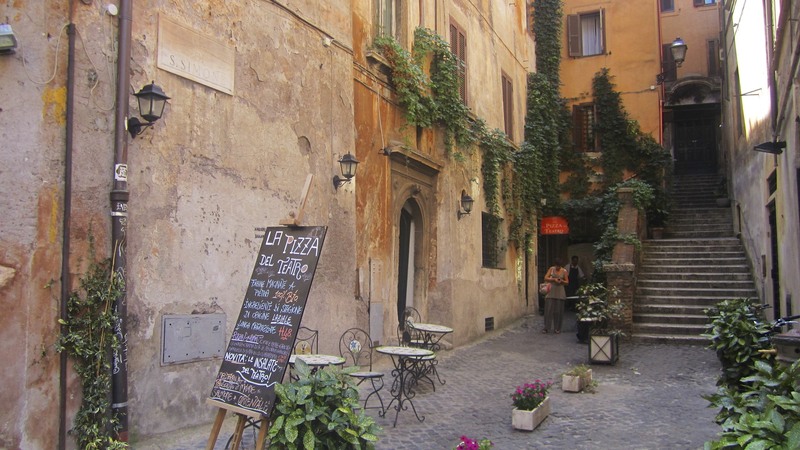 We got sidetracked while passing Piazza Navona, and decided to stop for lunch. I had a vegetable risotto that put all other risotto dishes I’ve had to shame. I also enjoyed an Aperol Spritz, my favorite Italian indulgence. Our table was outside, so we were able to people watch, and enjoy the beauty of the piazza while we ate. I learned from the tour notes from my sister’s friend that the surrounding buildings at the piazza were build on the foundations of a Roman circus, this the space is in the shape of a large oval. 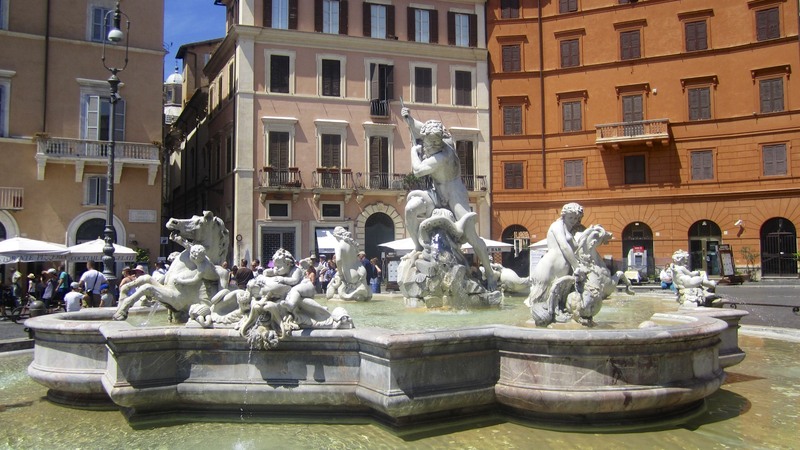 In the center of the piazza is Bernini’s Fountain of the Four Rivers. 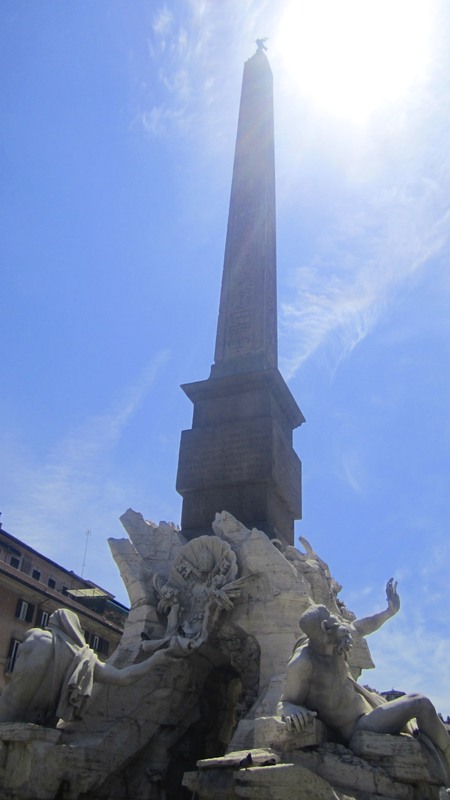 There are two other statues in the space, the Fontana del Moro and the Fountain of Neptune. 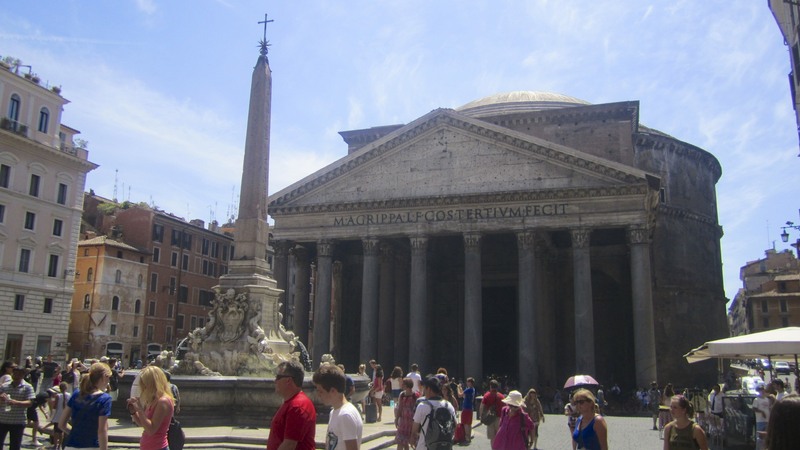 Next, we walked the final few blocks to the Pantheon. Access is free, so we were able to go in and really appreciate the structure. 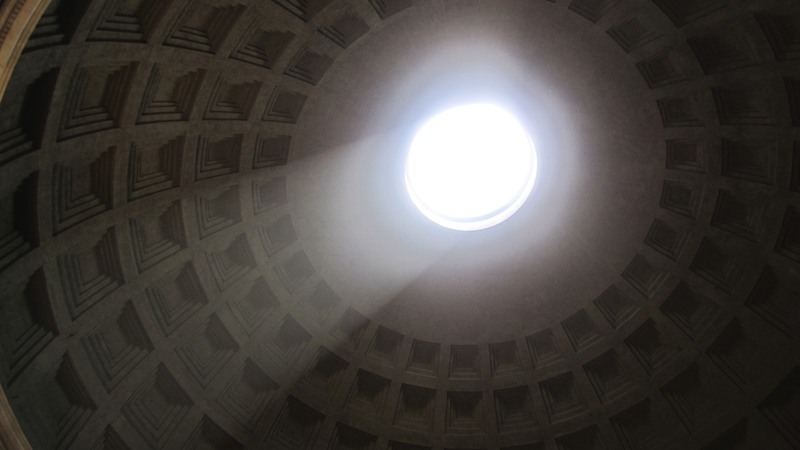 The Pantheon was build around 126 AD. 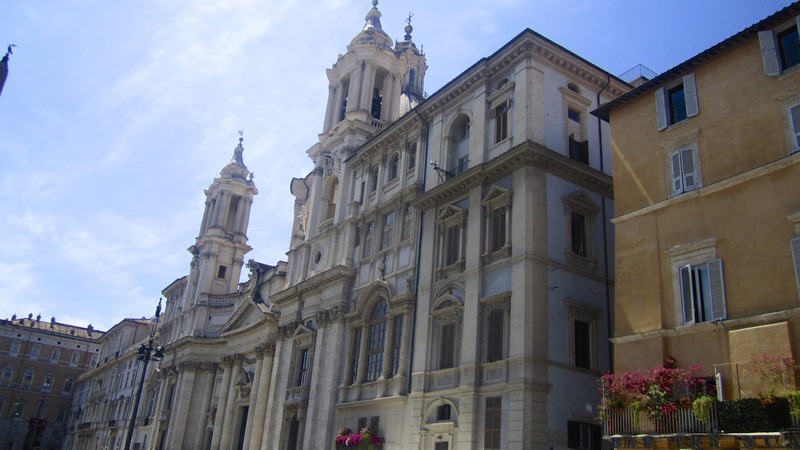 It is one of the best preserved Ancient Roman buildings, and was shockingly advanced for its time. The concrete dome has an oculus that opens to the sky. This dome is still the world’s largest unreinforced concrete dome. 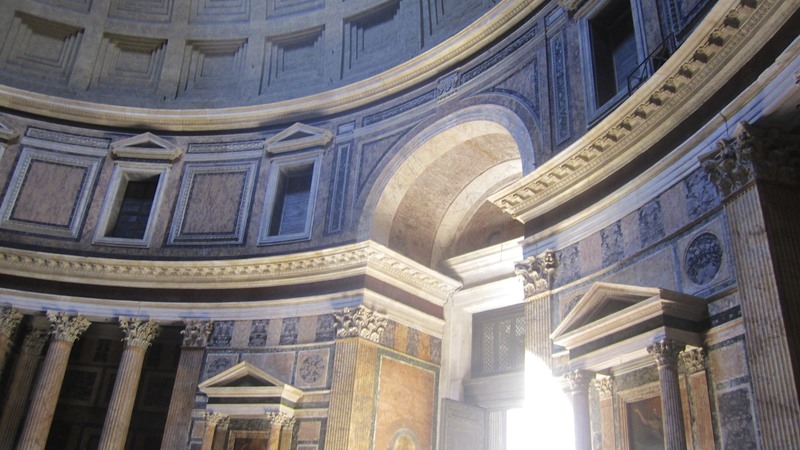 The Pantheon has been in continuous use since it was built, and since the 7th century, has been used as a Catholic church. Time was already running out, so we started back towards the bus. 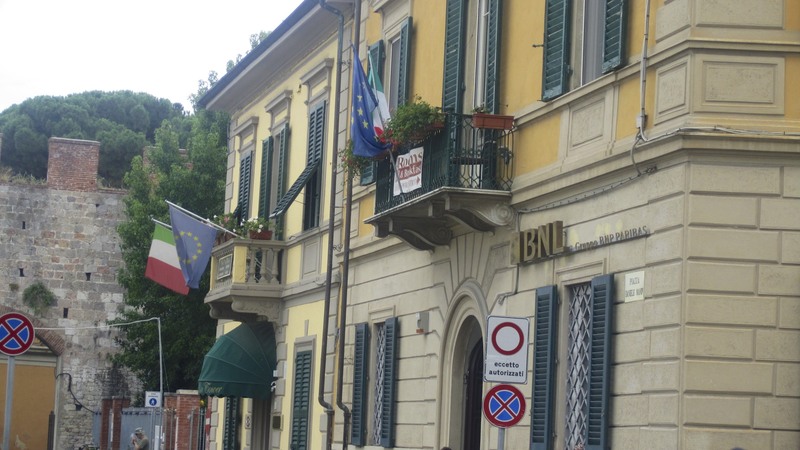 We walked down Via Dei Coronari again, and stopped at the Gelateria del Teatro. I had “pure chocolate” and pistachio flavors in a small cup. The chocolate was rich and delicious, and the pistachio was probably the best I’ve had. 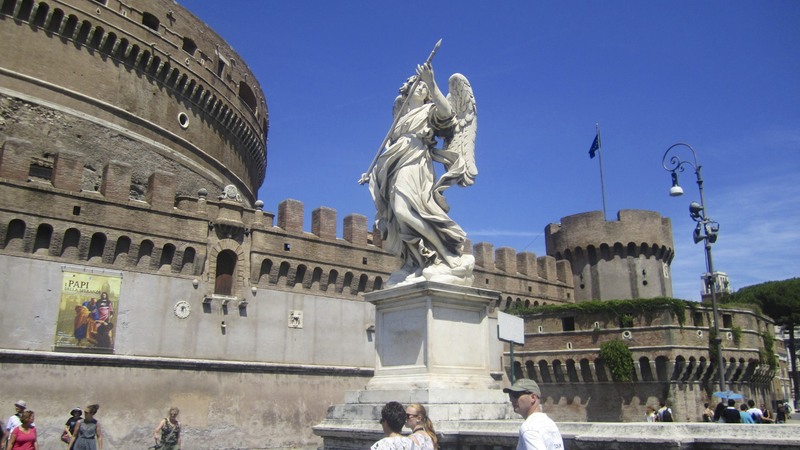 We crossed Ponte Sant’Angelo, a pedestrian bridge flanked by angel statues, and came upon Castel Sant’Angelo, also known as the Mausoleum of Hadrian. In the past, the mausoleum has been used as a fortress and a castle, but now is a museum. We continued walking, and had just enough time for a glass of wine across fro the Vatican Museum before getting back on the bus. 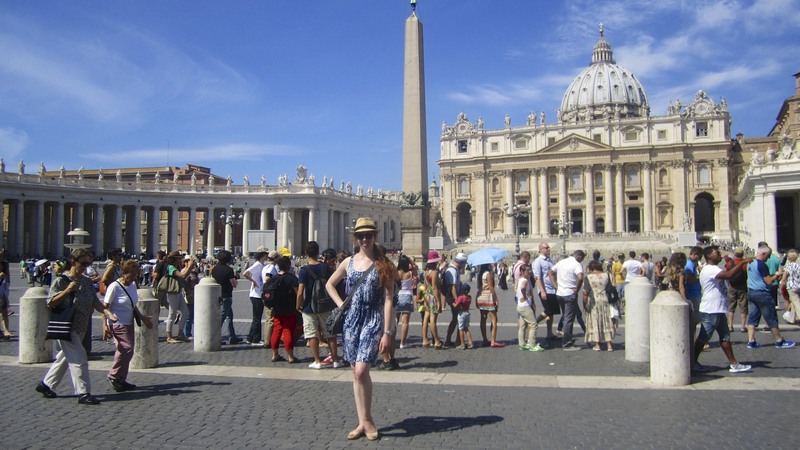 I would have loved to have more time in Rome, but I was able to enjoy every minute of my day there. No complaints! The last cruise was extremely busy! In addition to installing murder mystery, we had multiple parade rehearsals during port days, and one of my sisters was on board. Thus, my free time was spent entertaining. I haven’t spent that much time in heels in ages! Actually, I don’t think I’ve ever spent that much time in heels! When we stopped in Livorno, I luckily was able to get off the ship. My sister had gone out with a friend of the family while I was still in rehearsal, so I was left to explore on my own. 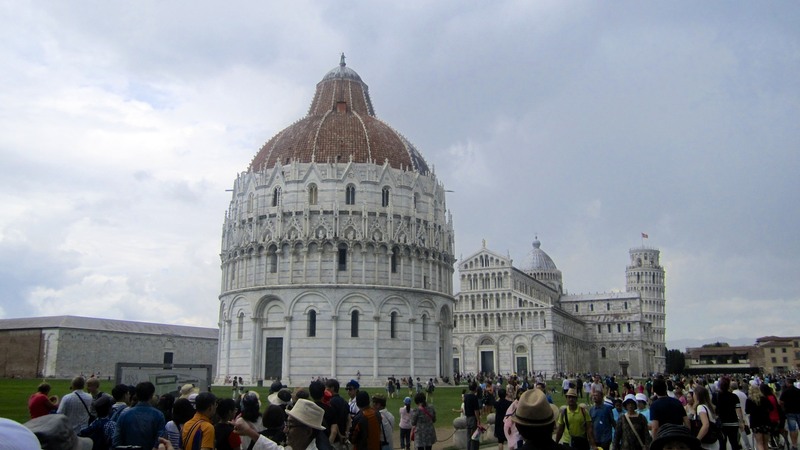 I buddied up to my roommate and her Italian-speaking boyfriend, and we made our way to Pisa. To get to our destination, we had to take a shuttle out of the port, a bus to the train station, a train, and then another bus! Although it was time consuming, I really enjoyed the journey. I got more of a local feel by riding the city buses, and was able to see some more of the beautiful landscape while on the train. 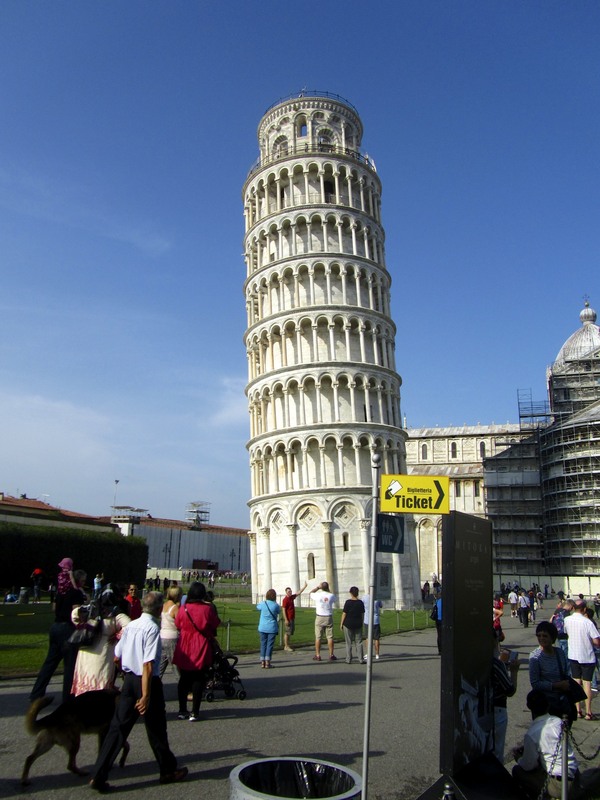 When we arrived at the Leaning Tower of Pisa, we walked through a small market with souvenirs, and then joined the masses taking photos by the tower. The neighboring church was stunning, but we weren’t able to go inside. Once we had enough photos with the tower/supporting the tower, we went off in search of food. We settled for a small café with outdoor tables and a view of the tower. 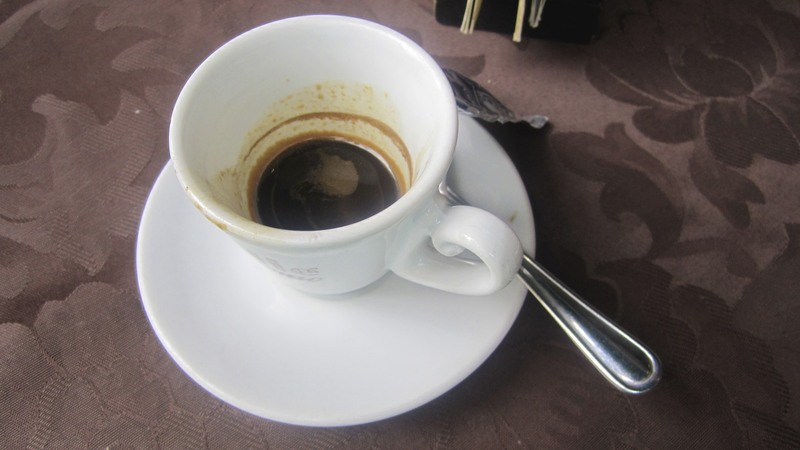 I had an espresso and a sandwich. I have to say, bread in Italy is much better than it is at home! While eating, I was amused by the other tourists. 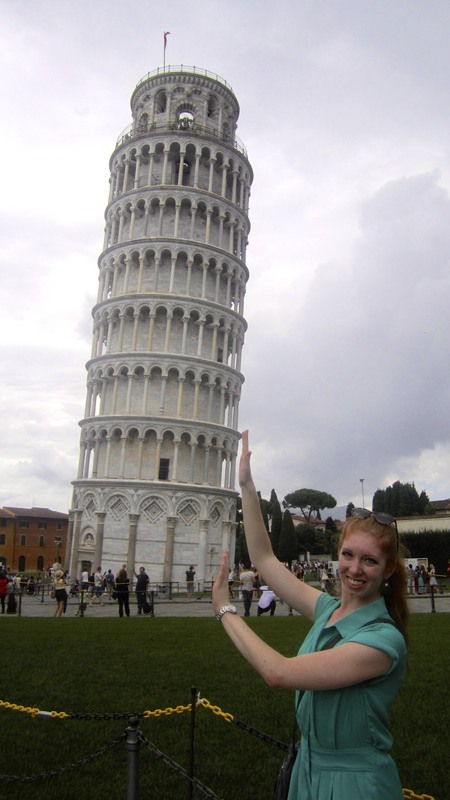 The amount of effort people put into getting a good photo was impressive. They were standing on fences, taking selfies, crouching, climbing, and battling for the best views. I was tempted to take a photo of the tourists taking photos, all lined up posing the same way. We ran into some friends from the ship as we finished our lunch, and then headed home. Two buses, a train, and a shuttle later, we were back at the ship. I had just enough time to take a nap and get cleaned up for my production shows! It was a busy, but very fun day.